December 09 - Its amazing how much can be fitted into a single month and December was a month of many parts. With Steve retired it was left to Jane to attend the annual works Christmas event which was held at the Walnut Tree in Blisworth and she had a good time particularly as Steve was acting as taxi driver so she could drink without worrying about the drive home. We also changed dentist this month and moved away from the dental practice that we'd been going to for the last 30+ years to one where we are now in the hands of the wife of one of the doctors where Jane works. We both had intensive inspections and clear instructions as to what we needed to do so that we would continue to keep our teeth into old age. 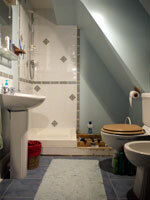 At the beginning of the month we discovered a leak under the shower in the main en-suite bathroom. Initially we thought it was due to a leak around the shower base but after removing the base we discovered that the waste pipe from the wash hand basin had split. This had caused considerable water staining to the hall ceiling which is directly below the bathroom. Our good friend Nick came to the rescue, set about replacing the pipe work and making sure the shower had a decent drop on it, something had never had before. In the meantime Steve undertook the task of cleaning the shower enclosure but this had to be done outside and seeing as the temperature had dropped close to zero for several weeks this took a lot longer than intended. Whilst we had the shower cubicle removed we decided to redecorate, find new toilet roll holder, towel rail, etc and generally give the room a face lift without going the whole hog and replacing all the sanitary ware which would have been both costly, very inconvenient and unnecessary as it is a white suite. The room is almost back to normal and it will soon go into full use within a week or two however it may take a little longer to remove the water stains from the hall ceiling. Mid month we had a serious snow fall and the temperatures dropped dramatically so it certainly changed the village scene. The house kept its covering for several days and it gave us a chance to get out for some walks around the village. The centre of the village never has its roads cleared because it is not part of a bus route and it is thankfully quite flat. There wasn't a problem in our road but some of the surfaces between villages proved to be quite slippery so the Honda CRV came into its own. Jane used the Honda to get to work because her Smart Car is very light and with such a short wheel base it doesn't just slide, it pirouettes on the spot. 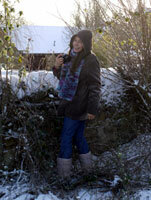 As part of one of our walks in the snow we did a tour of the village and walked across the field to the back of the garden where Jane posed briefly for a photo. 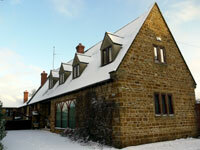 Although we had snow in February 2009 this month saw one of the longest spells of cold weather in over twenty years. We enjoyed it because the house was warm and the Honda managed to get us in and out of the village. 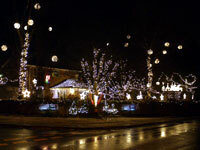 Despite concerns about climate change (also emotively known as global warming) people continue to decorate their houses with Christmas lights no doubt consuming significant power. This house in Blisworth is one of the more tasteful displays and they are collecting donations for charity. We had our own modest lights outside and on the Christmas tree but Steve is not a great supporter of the global warming theories particularly as the evidence is based on data over a 150 year period and our weather has been changing for millions of years so we didn't have a conscience about putting up our few lights. 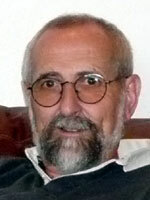 Steve had this desire that once he retired he would get himself a new desk and computer. The MESH computer arrived in late November having had to wait nearly a month for the graphics card to arrive in stock before it could be shipped. Of course whenever changing a computer there are always problems getting all the software loaded that was available on the old one. As always Jane gets Steve's "hand-me-downs" and Jane's machine which is over 6 years old is to be passed on to Sue to replace her old Windows 2000 PC that is heading towards being ten years old. These Dell PCs do last and Steve hopes his move away from Dell to MESH proves to be worthwhile. The desk proved an even larger mountain to climb. Steve knew exactly what he wanted from IKEA so we thought it would be a quick visit. The assistant seemed to be helpful and translated the requirement onto an order which we then collected from a separate warehouse about half a mile from the main store. When we arrived the assistant at the warehouse drew our attention to the fact that there were no legs ordered with the desk - quite an essential element - so we had to return to the main store, reorder the legs and then return to the warehouse again to collect them. At this point we were just pleased that all of the parts fitted in the back of the Honda. Unfortunately the story doesn't end there because after arriving home and a week later Steve unpacks all the packages to discover that the main desk piece swept the wrong way. This required another visit to IKEA to return the part and to get the right piece. 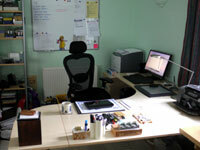 All's well that ends well because he has constructed the desk and is very pleased with the space and overall design. He just needs to connect all his peripherals to the PC and find a place on the desk for them all. Perhaps by the end of January he will have got it sorted - let's hope so. During the Christmas period we managed to get out on several walks around the village. One of our favourites is across the fields, along the Northampton Arm of the Grand Union Canal then up to Gayton before returning across the fields over the canal, the main west coast railway line and finally home. We had hoped to get a drink at one of the pubs in Gayton on Boxing Day however they were both closed. Another walk we did was from home across the fields to Banbury Lane and then over to the Upton One estate where Dave & Lucie live. We then walk on to visit Sue and Graham on the Weedon Road. At this point we're only a short distance from the centre of town. We do keep our eyes peeled for any unusual wildlife and it was good to see flocks of Fieldfares and Redwings, both winter visitors from Scandinavia. 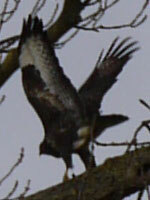 We have several buzzards in the vicinity of the village and this one was spotted on one of our walks. As we crossed the field he kept flying from tree to tree to keep us at a safe distance. There was a time, twenty years ago, when there were no buzzards in Northamptonshire but they are becoming more and more common which is really good news. 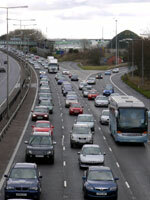 As if we need a reminder, travelling over the Christmas period is a nightmare. The M1 passes just to the north of the village. On one of our walks we passed over the motorway and took a few moments to wave at the poor devils who were having no fun getting to their destinations heading north. We were happy to be walking even if it was cold and the tracks were very muddy as the snow thawed during the day. A highlight of the month was the Ray Davies gig we went to at Hammersmith Apollo. It was unfortunate that we decided to drive down to London because shortly after setting out the M1 was closed and when we detoured onto the A5 the traffic ground to a halt and we spent the next one and a half hours travelling in stop/start sessions before managing to get back onto the motorway. So a journey that would normally take an hour and half took nearly three and a half hours. We were fortunate because it was the same weekend that the channel tunnel was closed because of multiple train breakdowns (melting snow caused condensation on the motors in the tunnels) and some people were stuck on this side of the channel for up to 12 hours sitting in their cars. We were fortunate because Jane's brother and his partner were allowing us to sleep at their house in North London so we parked up, had a quick cup of tea and then headed for Highbury and Islington tube station. We arrived at the venue with 15 minutes to spare. Jane had managed to get great seats with a good view and not a million miles away from the stage. So what about the performance - in short it was brilliant and given a chance we would go again. The show was spilt into three sets: to begin there was an acoustic session with Ray Davies and his lead guitarist and towards the end of this the band came on stage and joined in seamlessly. After the break the stage took on another aspect as the Crouch End Choral Group (there must have been 40 of them) took their places and the full wit and wisdom of his tunes came alive. We thoroughly enjoyed the event from beginning to end, singing ourselves horse to all his well know, lesser known , old and new songs. It was possibly the best gig we've ever been to. The journey back to Richard's wasn't without incident as the tube train stopped at Hyde Park Corner and wasn't going anywhere so we went up to the surface caught a bus to Green Park and then a tube back to Highbury and Islington station not getting in until about 12:30. The horrendous drive down, the rush across town, the tube failure on the way back - it was all worthwhile. We find it difficult to get to the cinema because Jane works until after 7pm on three nights of the week but she recently converted some of our Tesco club card points into cinema vouchers so we have an incentive to go more often. 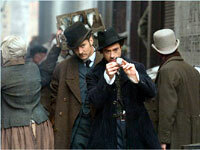 Rather than see Avatar at a time when it was most popular we opted to see Sherlock Holmes starring Robert Downey Junior and Jude Law. It was a ripping yarn set in Victorian England and had a similar pace to a modern James Bond movie, however that isn't a bad thing. We enjoyed the film and despite Jane falling asleep during certain parts (not unusual for her) we agreed we enjoyed it and would watch it again when it finally reaches out TVs. And so to the end of the year and all the festive fun. We spent Christmas Day with the usual suspects at Nick and Val's house and New Year's Eve at Sue & Graham's place. As always a good time was had by all despite the outside temperatures dropping well below zero on both nights. 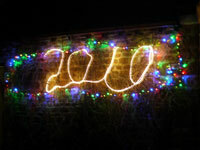 As a special feature we managed to purchase some lights in the sales and Steve spent a cold morning making the ribbon light into a 2010 sign, flashing on and off to emphasise the arrival of a new year. Last year we made some predictions about 2009 and we fulfilled them all. So I'm two months into my retirement and I'm not finding it too difficult to handle. I always get a bit irritable in the run up to Christmas and this year was no different even though I had more time than enough time to deal with all the arrangements - Christmas tree decoration, lights, etc. Despite having "spare" time I still don't manage to do all the things I set myself every day but I'm learning to potter around undertaking the Times T2 quick crossword and at least one Sudoku. The past month has seen us burning a lot of wood on the wood burner so every week I'm cutting, logging and stacking wood in the porch which takes at a few hours and I can do this no matter how cold it is because I soon get warm with all the exercise. Now that I'm no longer stuck to a desk or sitting in meetings I've become a lot fitter and am also losing weight but nothing too dramatic. I look forward to the weather getting a bit warmer so that I can spend more time in the garden.